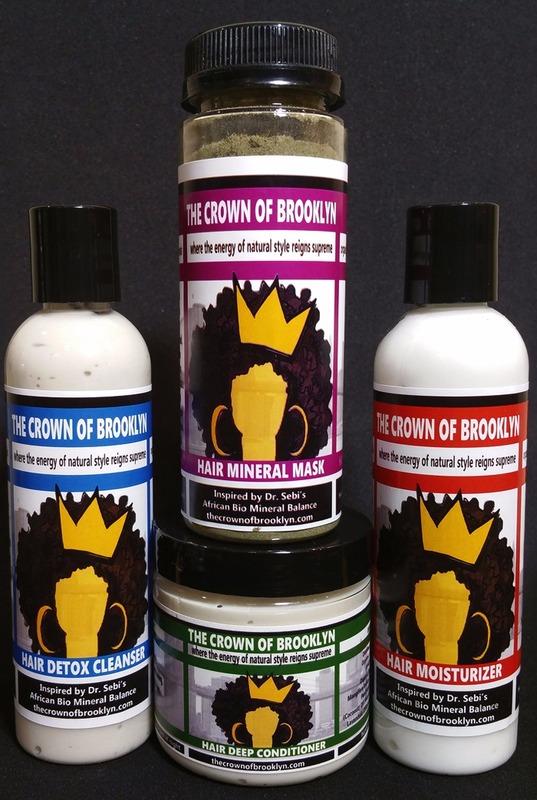 The Crown of Brooklyn Hair Detox Kit was designed to help you detox the scalp and hair shaft while adding minerals to the hair and scalp to optimize healthy hair growth. 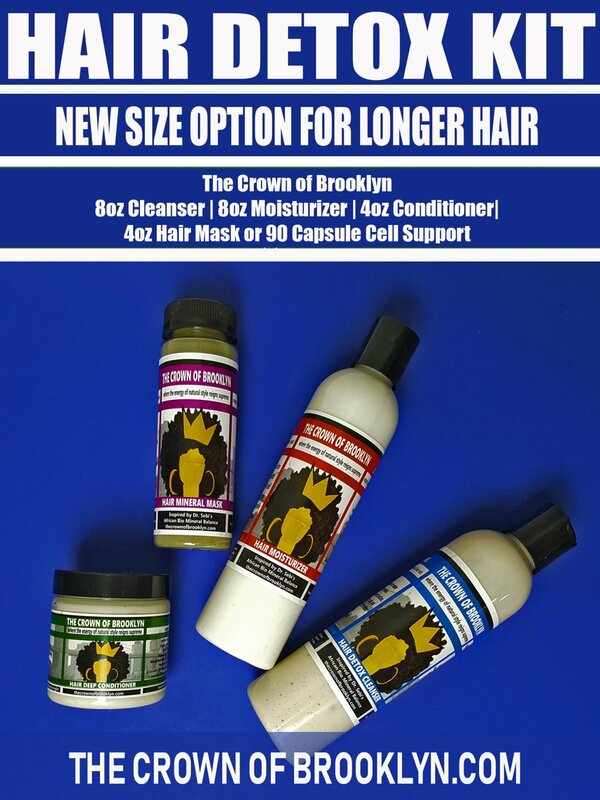 The Original Hair Detox Kit with Hair Mask has 4+ applications . You can use it for a month long hair and scalp detox (using weekly for 4 weeks) or you can use it as a hair booster when you want your hair to look and feel its best. The NEW 8oz Hair Detox Kit doubles the size of the Cleanser and Moisturizer for clients with longer hair. 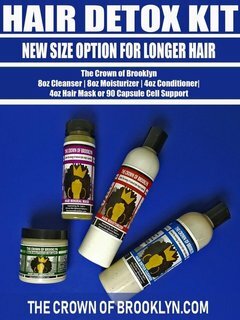 We have changed the capsules on ALL Hair Kits to our Cell Support Capsules that include a 30 day supply of 90 capsules. For more information on Cell Support, click here. 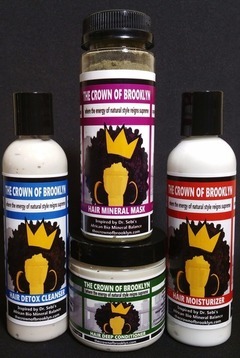 The Crown of Brooklyn's ingredients list is inspired by Dr. Sebi's African Bio Mineral Balance. 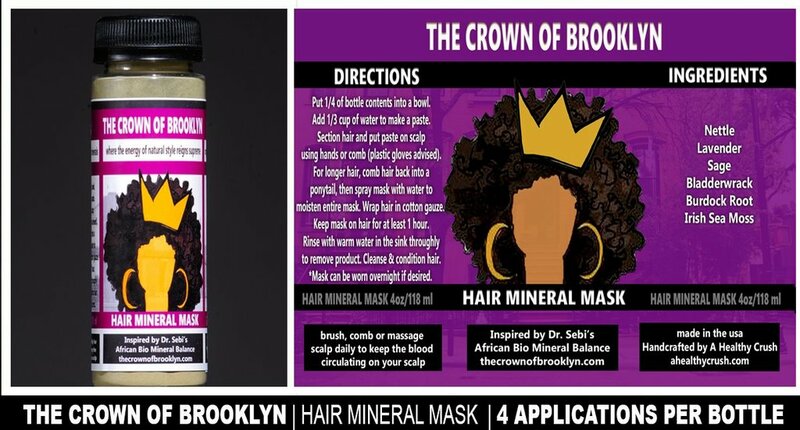 We use Irish Sea Moss, Bladderwrack & Burdock Root so that your scalp gets 102 of the minerals that the human body is comprised of. 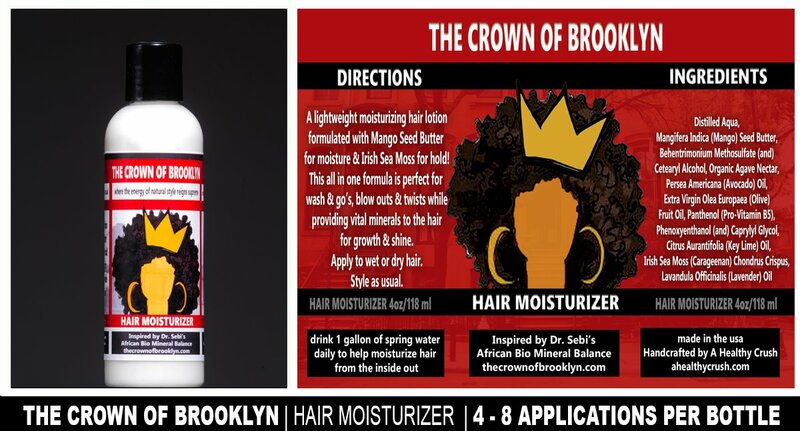 Your kit comes with helpful tips on the labels to help you create the hair your body can produce when it is healthy and hydrated. 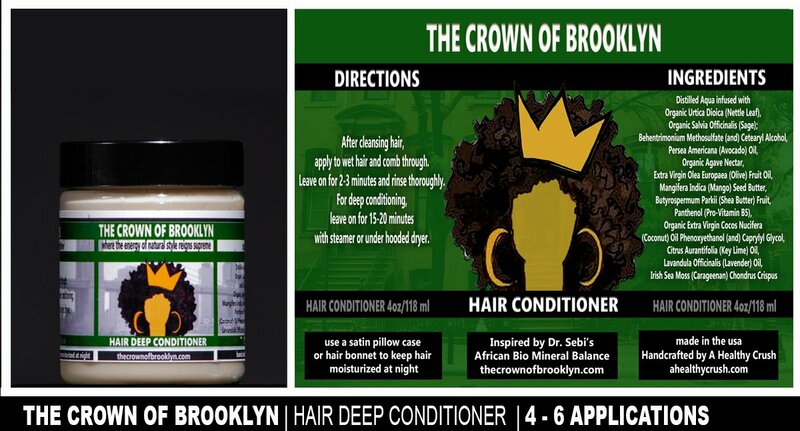 It is important to consider not just what you put on your hair but what you put in your mouth in order to grow strong, shiny hair. 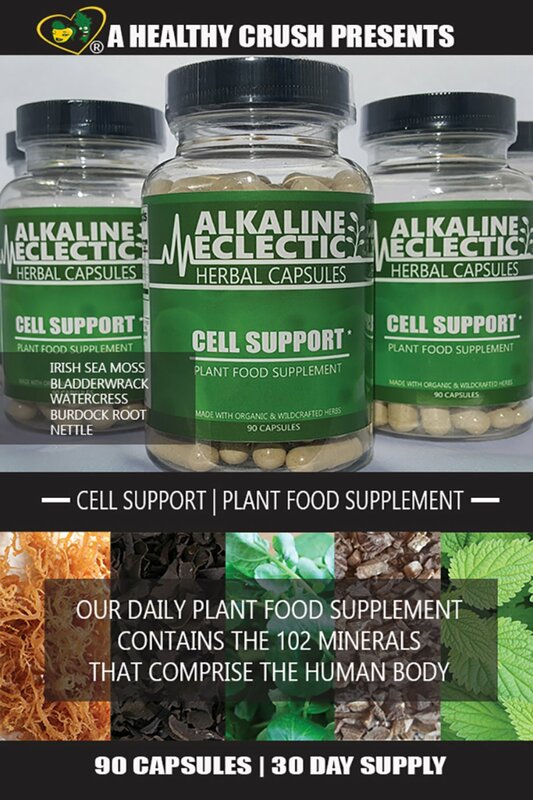 If you would like to order additional Soursop, Irish Sea Moss, Bladderwrack or any of our other 18 Alkaline Herbs, click here. 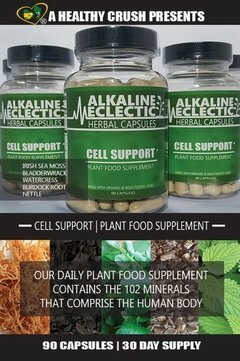 For more information about following an Alkaline ECLECTIC lifestyle and the basis of Dr. Sebi's African Bio Mineral Balance,click here. Our products are made in batches. 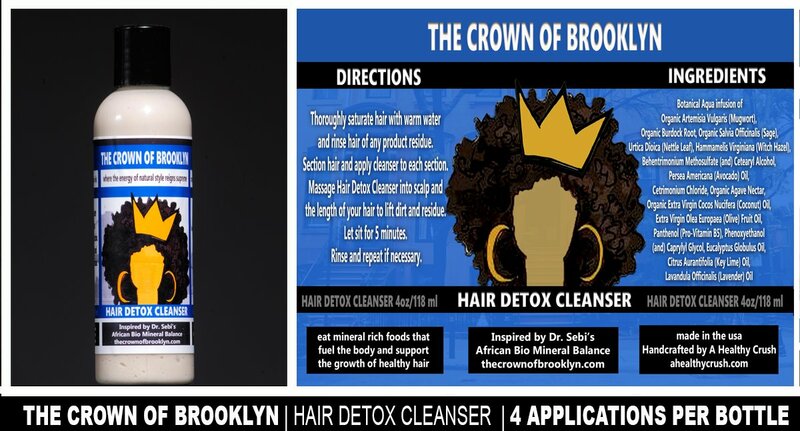 Hair Detox Kits ship based on their availability. Please allow at least 5 business days from the date of your order for your product to ship. This product can be used by women, men, and children of all hair types. Our capsules are not approved by the FDA and do not claim to work as a cure or treatment of any illness.